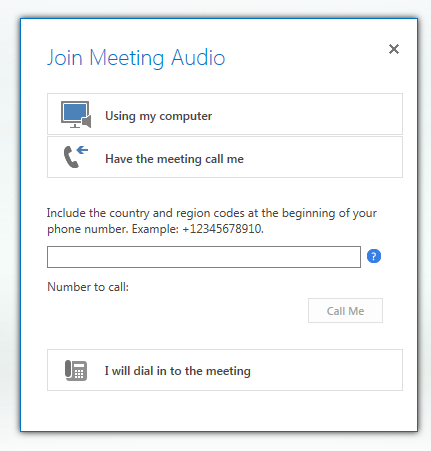 When you join a Lync Meeting from Lync Web App, install the plug-in to hear the meeting audio from your computer’s speakers or from a headset attached to your computer. Use the mic on your computer or headset to talk to other participants. If a participant is sharing their video, you can see it in the meeting window even if your computer doesn’t have a camera. If it does, and you want to show yourself to the other participants, point to the video icon and click Start My Video. To be able to use your computer’s mic and speakers or a headset, you have to install the plug-in. If you choose not to, or if your system administrator has disabled using computer audio and video in meetings, you can connect to the meeting audio using your phone. The Join Meeting Audio dialog box displays after you join the meeting. Depending on the settings configured by your system administrator, any combination of the following options will display. Choose the option that works best for you. Connect to the meeting audio using your computer’s mic and speakers. Have the conference call you at the phone number you specify. Dial into the meeting from your phone using one of the numbers displayed. ¹ This feature is available only if the meeting organizer’s Lync account is enabled for Enterprise Voice. To learn more, contact your technical support personnel. After you connect to the meeting audio and video from your computer, your credentials to access the Internet might need to be authenticated if your organization requires it. In the dialog box that displays, type your credentials and click OK.
Connect either a headset or an external mic and speakers to your computer. Then, point to the phone icon and click Lync Call. Point to the phone icon and click New Number. In the Call New Phone Number dialog box, type a phone number, and then click Call Me. The conference will call you at this number¹. Dial the conference number listed in the meeting invitation from your phone and enter the conference ID when prompted. Note: The options available to you depend on what your technical support team has enabled for your account.